If there is any subject that brings out the differences in people, it has to be history. Modern religious convictions are often a choice regarding which historical account of past events you believe, and the corresponding beliefs closely reflect one's historical ancestry. History is a window through which to look into the future. A nation that has a sense of a shared history, tend to develop a sense of common destiny. South Africans have conflicting versions of history. Winnie Madikizela-Mandela's death has laid bare the fact that we do not agree on a common version of history for this country. In fact, the history of South Africa relating to the apartheid years and the struggle against the regime remains the most contested history and source of major differences in the country. Instead of using Mama Winnie's passing as a moment to forge a common reflection on the glorious history of this country, including the courageous anti-apartheid struggle, South Africans resorted to desecrating that history by casting aspersions on the struggle role played by the giants such as Nelson Mandela and Desmond Tutu. Mama Winnie's funeral was unfortunately utilised by some to drive the idea that she was deliberately castigated by some within the ANC because of her radical stance on issues. A desperate witch hunt got underway as various speakers at the funeral wanted to outdo each other in pledging their commitment to Mama Winnie's legacy. The irony is that the very Mama Winnie in whose name people sought to rewrite history by desecrating the names of other struggle heroes, was someone who was not interested in flattering anyone. She spoke the truth irrespective of political consequences while some of the cheerleaders who have been singing out her name the loudest are only interested in political posturing. 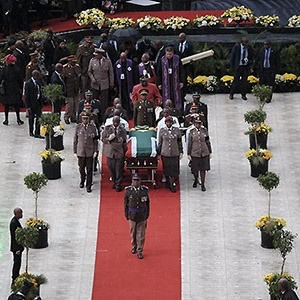 Funerals of political dignitaries have become a scene of political dishonesty in South Africa; a platform for politicians to jump on the spirituality bandwagon and use death to sing their high notes of self-righteousness. When giving final send-offs to those who have been great among us we become so desperate to add our names into the history books and that we are willing to desecrate the names of others. It is possible to pay homage to Mama Winnie without going after others. As a struggle figure, Mama Winnie stands tall on her own and she would have stood tall even without us having to belittle others who stood next to her in the struggle. If we continue belittling others whenever we send off the fallen heroes, by the time we bury our last struggle hero we will have no departed heroes to continue to honour and pay homage to. We would have dismantled the legacy of all our fallen heroes. Funerals tend to bring the worst level of dishonesty out in people, and it has been so with funerals of political leaders in South Africa. Unfortunately, our funerals are used for mud slinging. In Mama Winnie's passing we missed an opportunity to look into ourselves and read our history correctly – in an inclusive manner. We resigned ourselves to our parochial blame game, apportioning blame to our opponents while failing to appreciate perspective. If we continue to deliberately misread our history, we will forever miss an opportunity to turn the corner and commit to a common destiny as a nation. We did a disservice to Mama Winnie with our revolutionary presence and historical denialism, respectively. - Ralph Mathekga is a Fellow at the SARChI Chair: African Diplomacy and Foreign Policy at the University of Johannesburg and author of When Zuma Goes.